Category Archives: North Coast Brewing Co.
Other Notes: Named for a retired steam engine on the California Western Railroad Redwood Route. 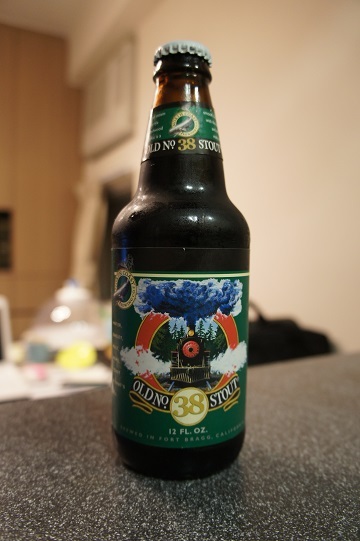 Brewer Description: (from bottle) Old No.38 Stout is a smooth, firm-bodied stout with the toasted character and coffee notes of dark malts and roasted barley. Intro: Poured from a 12 fl oz bottle into a pint glass. There was no bottled or best by date on the bottle. Appearance: The beer poured a rich opaque black colour with a bit less than one finger caramel tan head that dissipates quickly leaving a small amount of lacing. Aroma: Aromas are a bit weak, but mainly of roasted malts, cocoa dark chocolate and brown sugar. There is also a slight amount coffee mixed in. Taste: Sweet cocoa and roasted malts followed by brown sugar, milk chocolate, coffee and maybe a small amount of caramel. Mouthfeel: Creamy, sticky, light to medium bodied with light carbonation and a small alcohol kick. 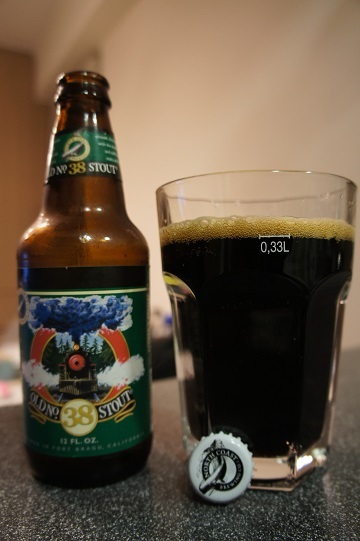 Overall: Overall this was a decent stout that may be a little bit on the sweet side. However when compared to Guinness, I have to say that I’m leaning towards Guinness for a variety of reasons. It’s not as sweet, only one-third of the cost, and a lot easier to find in Hong Kong since its available in every supermarket.